Longueval is a village approximately 13 kilometres east of Albert and 10 kilometres south of Bapaume. The Memorial is situated on a terrace in Caterpillar Valley Cemetery, which lies a short distance west of Longueval, on the south side of the road to Contalmaison. Caterpillar Valley was the name given by the army to the long valley which rises eastwards, past "Caterpillar Wood", to the high ground at Guillemont. The ground was captured, after very fierce fighting, in the latter part of July 1916. It was lost in the German advance of March 1918 and recovered by the 38th (Welsh) Division on 28 August 1918, when a little cemetery was made (now Plot 1 of this cemetery) containing 25 graves of the 38th Division and the 6th Dragoon Guards. 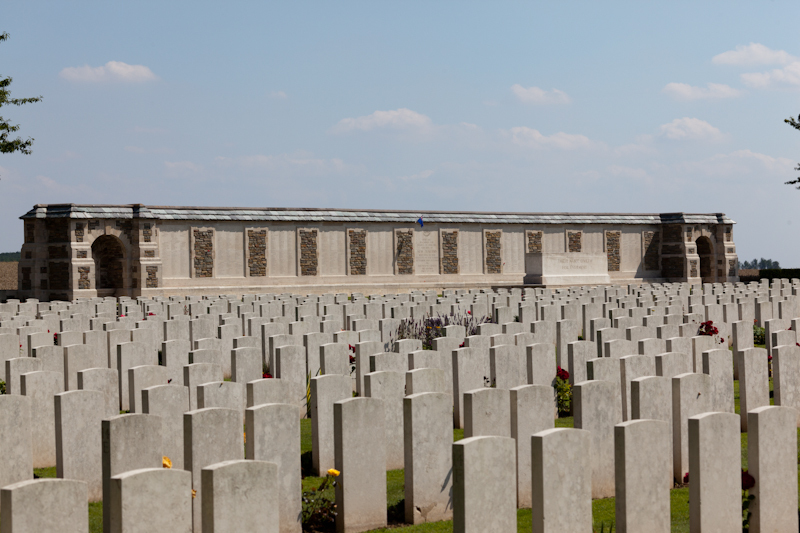 After the Armistice, this cemetery was hugely increased when the graves of more than 5,500 officers and men were brought in from other small cemeteries, and the battlefields of the Somme. The great majority of these soldiers died in the autumn of 1916 and almost all the rest in August or September 1918. 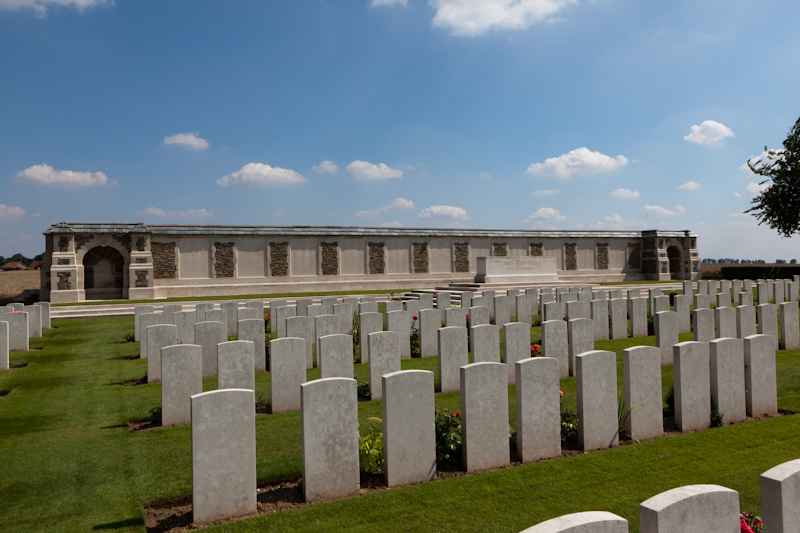 CATERPILLAR VALLEY CEMETERY now contains 5,569 Commonwealth burials and commemorations of the First World War. 3,796 of the burials are unidentified but there are special memorials to 32 casualties known or believed to be buried among them, and to three buried in McCormick's Post Cemetery whose graves were destroyed by shell fire. On 6 November 2004, the remains of an unidentified New Zealand soldier were entrusted to New Zealand at a ceremony held at the Longueval Memorial, France. The remains had been exhumed by staff of the Commonwealth War Graves Commission from Caterpillar Valley Cemetery, Longueval, France, Plot 14, Row A, Grave 27 and were later laid to rest within the Tomb of the Unknown Warrior, at the National War Memorial, Wellington, New Zealand. On the east side of the cemetery is the CATERPILLAR VALLEY (NEW ZEALAND) MEMORIAL, commemorating more than 1,200 officers and men of the New Zealand Division who died in the Battles of the Somme in 1916, and whose graves are not known. This is one of seven memorials in France and Belgium to those New Zealand soldiers who died on the Western Front and whose graves are not known. The memorials are all in cemeteries chosen as appropriate to the fighting in which the men died. Both cemetery and memorial were designed by Sir Herbert Baker.